Your Child is Lying! How you React… Makes a BIG Difference. Remember the first time your child lied to you and managed to get away with it? A sharp stinging pain probably jabbed your heart when you realized that your little angel has figured out how to con you. This is the moment you have to admit to yourself that your child is just like every other person- capable of telling lies to get what they want. It’s natural to feel disbelief, anger, or even guilt about your parenting abilities, then get frustrated and start blaming your child for being bad. None of that is going to help the situation though. This blog deconstructs why children lie, how parents can manage the behavior and how to coach children to make wise choices. You’re Likely the Reason for the Lies: Many times, without realizing it, parents set unachievable expectations for their children. The pressure we create causes kids to start lying because they don’t want to disappoint. Hiding and lying are often linked with fear. The lie might be an effort to protect their parent’s feelings and maintain their expectations. The intention driving a child’s lie matters, and can help shine some light on the inner workings of that child’s mind. Once we understand the gaps in our children’s knowledge, we can support their learning with appropriate coaching. Lying is Totally Normal and Appropriate: Lying is part of human behavior. Lying is totally normal and appropriate. Lying, within limits, is a natural and necessary skill to cultivate. Yes, you read that right- kids need to learn to lie- but they also must learn to discern when a lie is appropriate. Think about it, as adults, little lies make up a large part of our daily conversations. Lying is not necessarily a bad thing. When someone, asks “How do I look?” It is considered polite and socially appropriate to potentially lie and respond, “You look great!” No matter our true opinion. As adults, we lie to avoid sticky situations at work, dealing with our boss, avoiding confrontations, etc. It doesn’t make us bad people as long as we use the skill appropriately. 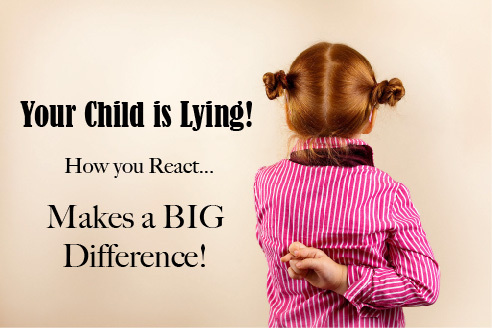 Knowing that lying is a natural behavior doesn’t change how shocking it feels when your little one does it to you. They are not becoming corrupt or immoral, rather they are just showing signs of growing up. Our kids need to learn how to distinguish white lies, that come from a place of good intentions, against lies meant to be deceitful and manipulative. When your kids lie, talk to them about why the lie was a wise decision or a manipulative one. Stress how important it is to not manipulate and deceive people or to lie to stay out of trouble when they knowingly made a sneaky decision. Keep coaching their wisdom, so they can make sound decisions in the future. Before expressing your feelings, calm down and think about the situation. Getting angry is not a productive response. An angry parent instantly activates the survival mode of a kid and prevents their parent from making any real progress coaching the kid’s bad behavior. Instead, engage in conversation. Ask your child questions to root out the why behind the fib. Were they trying to avoid getting in trouble? Were they afraid of something? Did they lack skills to solve a problem? Or was the lie said out of defiance? Again, when you understand their logic and reason, you can appropriately coach kids to make better decisions next time. The freedom to make and learn from mistakes is a fundamental part of childhood development. Create consistent boundaries and household rules for your child and then give them the independence to navigate within those boundaries. This freedom of choice will develop your child’s independence and provide important life experience so they learn how to make appropriate decisions and face any consequences. Over protective, domineering parenting styles prevent the development of logic, reason and independent thinking. Your job as a parent is to give your child life skills and coach them to be amazing adults, not boss them into being obedient robots. Kids rebel and lash out when they are given little freedom or choices. Think about the adult you want your kids to be and how to give them the skills they need to independently thrive in the world.